I always am in awe walking into Javitts Center the first day of this big show. How big you ask? Think about six football fields in size with 200,000 products shown by 2400 companies. And if that’s not enough for any bold person, you can go the day before and tour the Good Food Show, another 200 start up companies with new and innovative start up companies ready to try and enter the gourmet food market segment. 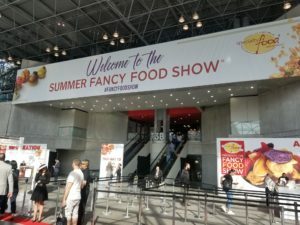 Doing both gives great balance to how start up companies begin as incubator babies and grow to some form or maturity as a full-fledged business, but there are plenty of small companies at the Fancy Food Show as well. In a short fifteen years, I have watched with amazement as this industry has grown to now approximately 16% of the food supply business in the US. Over $ 140 billion in sales and growing at a double digit rate of 13%. Put that in your kitchen basket and think about it. What propels this kind of growth? Many things, starting with changing dietary habits, the Food Channel shows inspiring people to entertain more often, a growing wine industry that adds cheese, crackers, meats, and other charcuterie items to a tray. It goes on and on. But what about this year? Here are a couple of my thoughts and sights seen and otherwise noted by others as trends, facts, and features of what’s going on in gourmet foods. 1). Food for the IGens. Those among us in age from 25 – 41 or so are having an tremendous influence on what is made, how it is made, and what goes into the product itself in ingredients. People in this age bracket have grown up with specialty foods, so it’s just their regular choice of items in their everyday mix on the grocery list. 2) Chocolate, and more Chocolate. Not that I’m complaining but how can we consume so much chocolate? Bars, truffles, confections, powders, and many more uses. An amazing display of wonderment to me, artistry in design, packaging, production, everything that can pop off a shelf ready to be purchased and sampled. One note of interest: a lot of chocolate sweetened with alternate products other than sugar, and some with excellent taste and flavor, see The Good Chocolate Company. 3) Upcycled products. A great idea, using imperfect plants or fruits to be included as an ingredient or additive for any product to achieve total usage, and certainly produce less wasted food as we have done in our past. A great trend. 4). Root to Stem Usage. Another great idea like above, reduced waste, and the excitement of producing a product with a different taste and flavor. 5). Tumeric Everywhere. Each show has its flavor of the show, it has become a test with some of my good industry friends and colleagues. What was the flavor this show? For sure this show it was turmeric, albeit good for you, certainly everywhere. In syrups (think cheese trays not pancakes ), in honey ( great idea ), and believe it or not I tasted it in an organic lemonade… and like it a lot ! 6) Cauliflower Power. I borrowed this phrase, not clever enough to come up with it on my own but did notice the usage of this veggie that I used to not be able to look at as a southern boy at the kitchen table with my Mom standing over me making the effort to put good food down my throat. Consider cauliflower as an ingredient in pizza crusts, crackers, also used as a substitute for rice on lots of cultural menu favorites. Here’s the best one: I ate a cauliflower pretzel ! Innovation at its best. If my Mom would have had this at her disposal, I would have eaten my veggies every night. This show inspires me as it offers ideas I can take back and discuss with my regular clients, even my good friends who want to know what was new and unique at the show. My hat is off to all the people who braved the big city to take a booth and show their wonderful wares, and to those like me who returned to once again be amazed and in awe of the talent and creativity in our industry. I can’t wait for San Francisco in January, hope to be there as well.